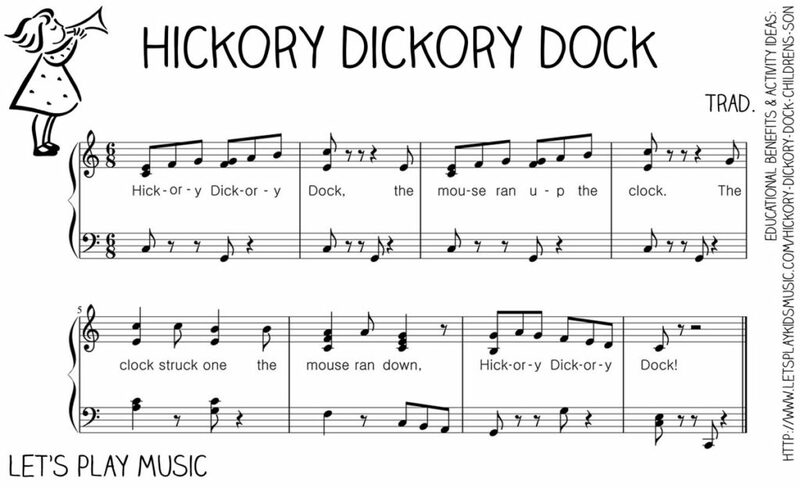 Hickory Dickory Dock is an all time favourite nursery rhyme for babies, toddlers and small children. 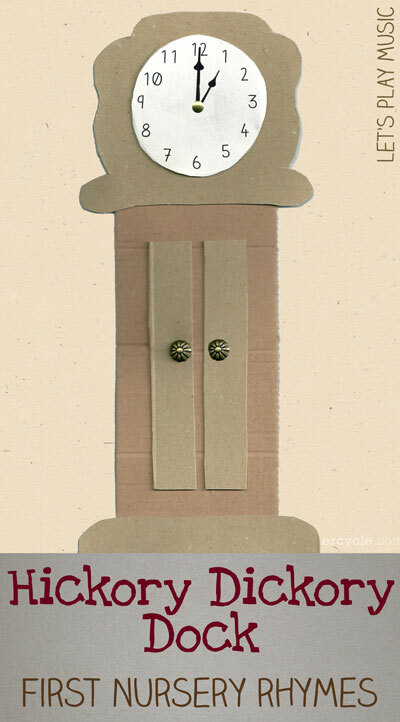 It is also a great opportunity to make an upcycled Hickory Dickory Dock out of old cardboard boxes, and a little mouse out of some old scraps of material. Once you’ve made these, you’ll find that they come out time and time again along with this fun song, game and activity. For the craft activity ‘How To’ scroll to the bottom of the page. For very little ones you can sing the song together demonstrating the actions, encouraging and praising any attempts to join in. The song has the steady beat of the tick tock of the clock throughout, so it is perfect for learning to feel and recognise the beat. Even very little babies will understand the concept of a little mouse running up and down, and will love a pretend mouse tickling them as it runs up their arm and down again – giggles guaranteed! Sing the song several times (babies will love the repetition) and explore all of the different rhythms, either with wooden sticks or a drum to tap the tick tocks (wooden spoons and biscuit tins work well here). Take it in turns to keep the beat going while everyone sings the song. 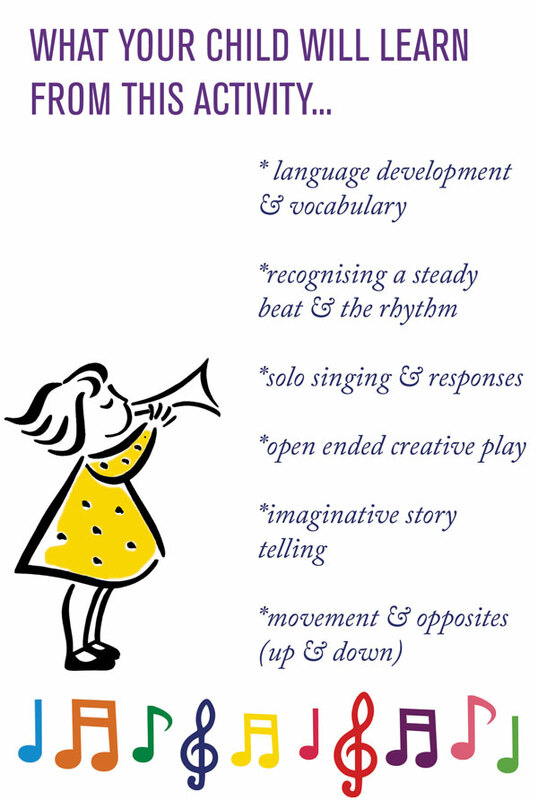 Encourage the children to first of all tap the beat (tick-tock) and keep it going steadily whilst everyone else sings the song with the actions. This works really well if you have some friends round to play, although can also just be done with the two of you! 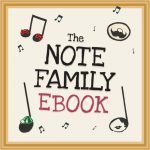 Some children will be able to imitate the rhythm of the words, and this is excellent for them to practice recognising the difference between the rhythm and the beat. 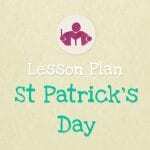 If you want to check out how Hickory Dickory Dock can be used as a part of a full music lesson plan for a variety of ages, take a look at my Clocks & Mice lesson plan. For hours of fun, singing Hickory Dickory Dock, and playing ‘mousey peeping’ games to surprise everyone! 1. Get your fan shaped piece of velvet, or cut out a fan shape, roll it round into a cone, and sew down the side seam. 2. Stuff the cone with some wool/bit of material, tuck in the excess material and sew neatly across the bottom to make your little mouse body. 3. Use two small black beads and buttons for the eyes, and sew them on very securely either side of the cone point. 7. Cut two small triangular pieces of material and secure onto the top of his head for little ears! 1. Duct tape, scissors, a drawing pin or split pin, needle and thread. 1. Tape your three boxes together securely with duct tape, with the weighted one at the bottom. 2. In the long upright box, cut two opening doors in the front, and a corresponding hole in the back so that you make the mouse peep in and out of the doors during the song. 3. You can either paint, or stick on a clock face with clearly marked numbers. Attach your black card clock hands using either a drawing pin or a split pin. 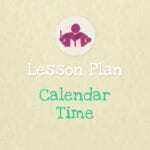 This makes a wonderful resource for learning to tell the time for slightly older children. 4. Decorate the body of the clock however you like, getting the children to draw all over it with felt tips or paints, or using fabric, wallpaper or wrapping paper. 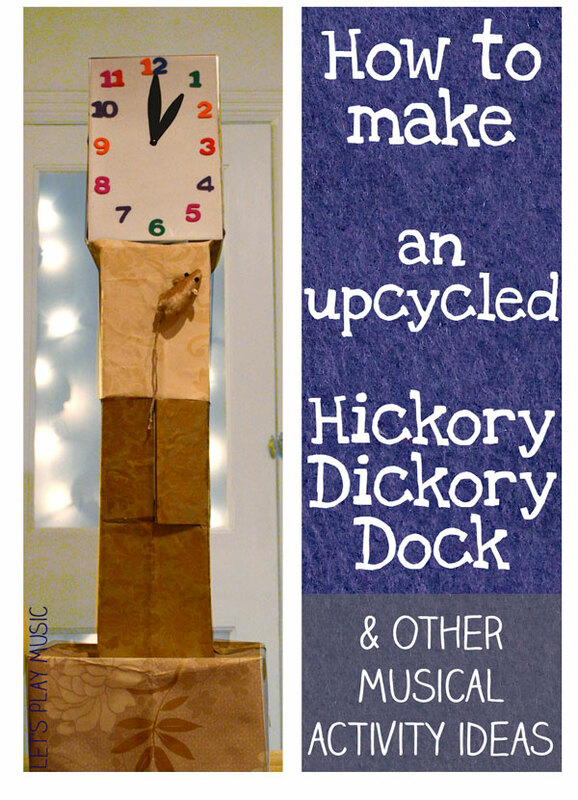 To download the free sheet music (easy piano for teacher accompaniment) for Hickory Dickory Dock click on the thumbnail below. So fun! I remember HHD as a kid! It was defeintely one of my favorites. Thank you for sharing. Pinned. Thanks Heather! I always find that it’s a favourite too – sometimes the classics are the best! Thanks for stopping by and for pinning too! So fun!! We had a nursery rhyme themed party and used a big cardboard clock someone at my church had made for a fundraiser’s story time and a cat toy mouse for a decoration for Hickory Dickory Dock. Thank you for sharing at Sharing Saturday! Glad you all had such fun! It sounds like a great party! The illustrations on that app are so lovely! Opening up so many different ways to play with music!